This one came out of left field: Neither Salil Chowdhury nor Usha Khanna have ever struck me as the most exciting of Bollywood composers (although rumour has it that the latter made some good ones); then I stumbled over this two-fer real cheap, figured I'd have a listen... and guess what? It's excellent! It's an unassuming sleeve (unassuming? downright awful more like it), but inside lie a couple of ace songs. The 'Mere Bhaiya' tracks are mostly traditional, but of the sort I like... 'Pyas Liye Manwa' for instance, very nice. 'Chanchal Man Par Chhaye' also has a certain charm to it, even though Chowdhury's attempt at rock 'n' roll isn't on par with, say Shankar Jaikishan at their best. 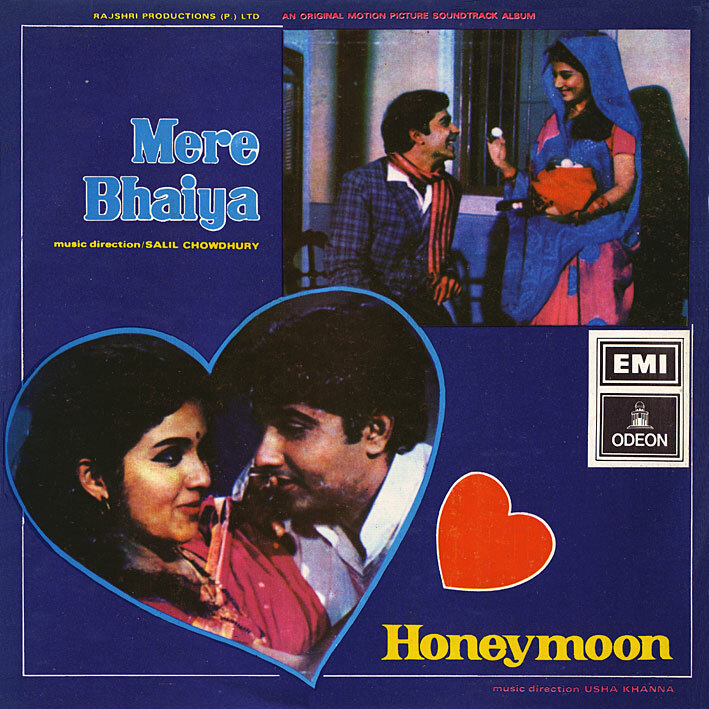 It's the 'Honeymoon' side however that's the main point of interest, with two killer tunes included: 'Jeevan Hai Ek Sapna' gallops off like a Morricone western thing (whistling, guitar twangs and whip cracks) and has a great soaring melody, while 'Mere Pyase Man Ki Bahar' begins really lovely with the two singers calling to each other, then a cool shuffling beat starts up, and then the main melody which reminds me a bit of Lee Hazlewood & Nancy Sinatra's 'Summer Wine' - something that can only be a plus (that might be just me though), absolutely great stuff! Yup, I really need to check up on Usha Khanna a bit more. Just did... works fine here. Try this: right click on the downloaded zip file, open with winrar archiver. Then in the winrar window go to tools and choose repair archive, make sure "treat the corrupt archive as Zip" is selected and choose a location for it, hit ok and that should do the trick! You'll get another zip file that says rebuilt.merehoneymoon and now just extract that one regularly. Bloody stupid Windows... virus prone, malware infested, rubbish system... can't even handle a forward slash... tsk! Anyway, I've renamed and re-uploaded the file, no slashes on this one, hopefully it'll work better. One of my favourites Bollywood soundtrack is a Usha Khanna one. A movie with Shammy kapoor. Check that one, it's great. Usha Kahnna is a woman. Indeed she is... I think the only female music director from that era that I'm aware of. Love the lilting music of Salil C and this almost unheard album is such a delight! Thank you soooo much. I like Usha Khanna a lot too .. Shabnam, Nishaan, Aao Pyar Karein... some awesome numbers there. If you don't mind, can you please re-up 'Honeymoon' ?. Doesn't the Rapidshare link work? The Rapidshare link wasn't working for me originally, which is why I asked you, but I finally was able to download it :). Thanks for the songs !...Honeymoon's an excellent album. Thanks Tala as well for the re-up ! The rapidshare link is no longer active. Can anyone re-up please? PC can you please re-post honeymoon link? Expired links won't be renewed, sorry. Please, it's the only broken link (the only one without linx to sharebee indeed) on your blog, why don't repair it ? Thank's a lot for everything, i discovered a new musical horizon.